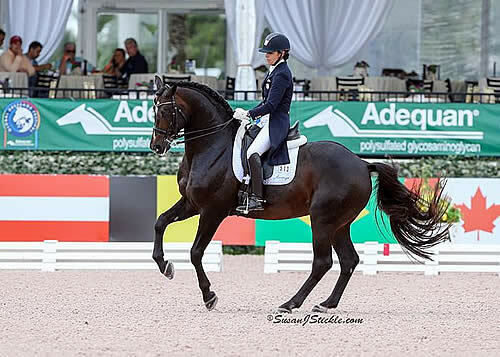 Wellington, FL – March 31, 2016 – Team USA dominated the 2016 Stillpoint Farm FEI Nations’ Cup CDIO 3* at Adequan® Global Dressage Festival (AGDF), handily winning the competition with a total team score of 454.698. Canada finished in second place with a total score of 428.708, while Spain rounded out the top three, collecting the bronze medal with a total team score of 414.421. The Stillpoint Farm FEI Nations’ Cup CDIO 3* continues Friday with the FEI Intermediaire I Freestyle CDIO 3* at 4:30 p.m. and the FEI Grand Prix Freestyle CDIO 3* beginning at 8:30 p.m. as the final “Friday Night Stars” Grand Prix Freestyle event of the 2016 AGDF season. Shelly Francis, Laura Graves, Arlene “Tuny” Page, and Kasey Perry-Glass each represented Team USA with class and poise, with two of the four team members earning personal best scores. Chef d’Equipe Robert Dover was pleased with the team’s accuracy and finish through the two days of competition and is excited for the continued expansion and growth of dressage in the United States. “The Nations’ Cup here in Wellington has been a tremendous competition and growing in quality each year,” said Dover. “One, I’m so thankful to the sponsors of this show, Stillpoint Farm, and of course Adequan® who is incredible, and to the managers of this show at AGDF, which is making it the mecca that it is for our sport. Laura Graves and Verdades continued their dominance in the competition this week, picking up another major victory in the FEI Grand Prix Special CDIO 3* with a score of 78.294%, which helped to solidify Team USA’s first place finish. The duo continues to near the elusive 80% mark and seemed confident and precise in the ring in the first two days of competition. “To be invited to ride on a team is something that you just don’t say not to. I love that we’re able to put USA on top of a podium. It’s always a nice feeling to have such a strong team to compete with. It feels very secure and it takes a lot of the pressure of competing off of yourself as an individual. You’re just riding for the team,” said Graves. Watch Laura Graves and Verdades win the FEI Grand Prix Special CDIO 3* here! Arlene Page and Woodstock have had a stellar season, solidifying their partnership and showing the potential the pair has together in Large Tour competition. Page, the owner of Stillpoint Farm, has been impressed with the expansion and development of the Nations’ Cup class at AGDF over the course of the past four years and feels that it is invaluable to the circuit each year. “He was a bit more on his game today and was a little bit more up in his carriage and just in a very good place to develop a whole lot more power and expression. When you get to stand on top of the highest podium, it’s a very good feeling,” she continued. As the breakout stars for Team USA this season, Kasey Perry-Glass and Goerklintgaards Dublet have surpassed all expectations for the pair’s first season debut in Large Tour competition. Perry-Glass represented the United States in last year’s Nations’ Cup aboard “Dublet”, but in the Small Tour classes. Team Canada, who finished in second place, was led by veteran pair Belinda Trussell and Anton, who have collected a number of wins this season at AGDF, continuously showing that they’re a reliable and competitive pair for the Canadian team. As the high point rider for the Small Tour portion of the FEI Nations’ Cup competition, Juan Matute Jr. led Spain to a third place finish. Piloting Dhannie Ymas to two high scores, Matute Jr. feels confident with the progress the pair has made over the course of this season, mostly competing in the FEI Young Rider division offered at AGDF. Allison Brock (USA) and Rosevelt proved once again that their focus on consistency and communication so far this season is continuing to pay off as the duo earned a 73.700% in the FEI Grand Prix CDI 3*, presented by Harmony Sporthorses. Brock and Rosevelt were followed by Ashley Holzer (CAN) and Breaking Dawn with a 72.680%, and Lars Petersen (DEN) and Mariett who rounded out the top three with a score of 70.980%. Brock and Rosevelt are finally feeling the results of their hard work this season, as both horse and rider have a newfound sense of confidence in the ring together. The pair have scored above 73% in their last two outings at AGDF in the Grand Prix, and Brock is thrilled with the progression the pair has made since the FEI CDI 5* at AGDF in February. “I’m really proud of him and at the same time, I think he’s really proud of himself,” she smiled. Over the past three months Brock has been very candid about the progress the duo has made, despite their small blip at the CDI 5*, where Brock felt the duo did not perform up to their best potential. P. J. Rizvi, owner of Breaking Dawn, represented Holzer at the press conference and spoke with only high praise of Holzer’s relationship with Breaking Dawn and their inspiring connection with each other in the ring. Rizvi, who also competes Breaking Dawn in CDI competition herself, gives Holzer the reins when she is out of town or unable to compete. Holzer and Breaking Dawn competed for Team Canada at the 2012 Olympic Games in London, England and their return to the competition ring is always special for both Holzer and Rizvi. “Her zig zags today were perfect, which are always a challenge for me in my tests. She landed with plenty of room and her zig zags and her changes were clean. It was textbook, just perfectly executed,” she continued. Competing as an amateur, Rizvi has a strong understanding of the commitment and dedication it takes to stay at the top of the sport, and has the utmost appreciation for professionals who are able to exercise the full potential in the competition arena. Petersen and Mariett, who finished in third place, found the heat a bit difficult, as Petersen noted he felt that he had no gas by the end of the test, which he contributed in part to a long season’s end approaching, as well as the temperatures which soared to the high 80s. “Normally, she’s not so bad when it’s hot out, but today I just didn’t feel like we had enough energy, but you know it’s that, she’s eighteen years old, and it’s the end of season. It’s probably a combination of all of those factors I think,” said Petersen. “I thought most of our canter tour was pretty good and I was happy with it, but I think we lacked the energy we needed in the piaffe and the passage,” he noted. If all goes according to plan for Petersen and Mariett, the duo will look to travel to Europe this spring in hopes of competing at the Danish Championships in June. Competition continues at AGDF Friday with the FEI Intermediaire I CDI 1*, presented by YellowBird Farm, as well as individual competition in the Stillpoint Farm FEI Nations’ Cup CDIO 3*, with the FEI Intermediaire I Freestyle CDIO 3* starting at 4:30 p.m. and the FEI Grand Prix Freestyle CDIO 3*, the final “Friday Night Lights” of the 2016 AGDF circuit, beginning at 8:30 p.m. For more information, please visit www.globaldressagefestival.com. The Adequan Global Dressage Festival (AGDF) is one of the world’s largest international and national dressage circuits featuring 7 FEI Dressage events, including a 5* and the only FEI Nations’ Cup Series CDIO in the Western Hemisphere. The AGDF offers more than $700,000 in prize money for the seven international competitions, making it one of the richest circuits in the world. The Stadium at Palm Beach International Equestrian Center facility includes the Van Kampen covered arena (made possible by Kimberly and Frederic Boyer and family) and four outdoor arenas with world-class footing, 200 permanent stalls, and a VIP seating area.